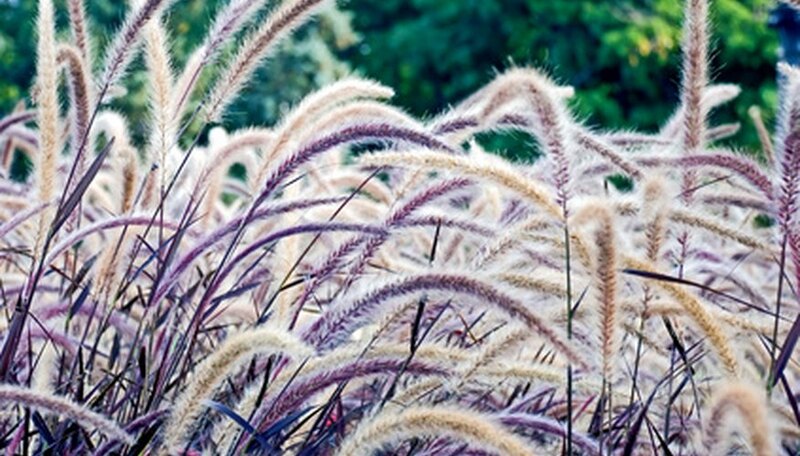 Ornamental grasses are durable, versatile and exhibit attractive color, which is why they are used indoors as container plants. These grasses spruce up a dull setting and add color to it. With a little knowledge of grass care, almost anyone can grow ornamental grass indoors for a visually soothing and calming effect. Because ornamental grasses adapt to a variety of environments, select a container that looks aesthetically pleasing and complements the decor of the room or surrounding area. Common types include terra cotta, brass, wood, metal or ceramic. Select one with an unusual shape to add visual interest to the spot. Make sure it has adequate drainage holes in the bottom, or drill them yourself to prevent root rot. Also, line the container with a 2-inch thick layer of pebbles or gravel to improve drainage. Select seeds or young plants of the type of ornamental grass you want to grow from a nursery or garden supply center. Common types include zebra grass, blue fescue, silky thread grass, purple majesty, maiden grass, pampas and tender fountain. Fill the container two-thirds of the way with good quality potting soil and lower the seed or plant into it. Space plants three to four inches apart or more for taller varieties. Ideally, space them as far apart as they will grow in height. Water well to ensure the soil is completely soaked and excess water drains out of the holes. Place a tray or large saucer under the container to collect drained water. Water the plant frequently during the first year to encourage the development of strong roots. Water at least once a week afterward. Avoid over-watering, which encourages the grass to spread and grow wildly. Fertilize once with a slow-release fertilizer, ideally in spring. Over-fertilizing leads to excessive growth. Make sure the container gets at least four hours of sunlight indoors. Rhizome-forming varieties of ornamental grasses are known to be invasive, so transfer them to a bigger pot if they start to outgrow the original container. Spray pests on ornamental grass, such as aphids or spider mites, with water to remove them from the plant. Cut back old or dying foliage to promote healthy, new growth on the plant. Use grass shears or handheld pruners when trimming or cutting back the grass, conforming to the plant's overall shape.